Last time my stalking was a rather random one. After meeting a reader, I jotted some notes, pondered the kind of person he/she is, and then perhaps waited past several stations for the next target. I felt like being too personal. If I truly believe in the magic of connection between author, reader and traveler, I figured, I should let the books decide whom I meet, how far I go and when to take off. So I am developing a Stalker prescription through which any potential flaneur can try to follow, especially those who like reading Walter Benjamin but are too afraid to take the first stroll wandering around the city aimlessly. Step#1: Follow the person whom you see with a book in hand. Rule: Only books. No newspaper, magazine, crossword puzzle or Sudoku. Step#2: Take a ride with him/her throughout the entire trip within UBahn. Rule: Basically from where the person rides on-board to where he/she takes off. 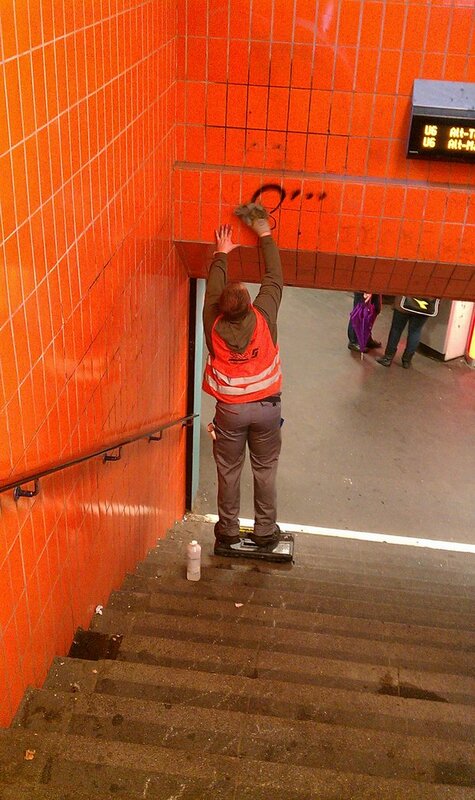 Of course if the person is just changing lines, you can follow through. Step#3: Approach the reader. 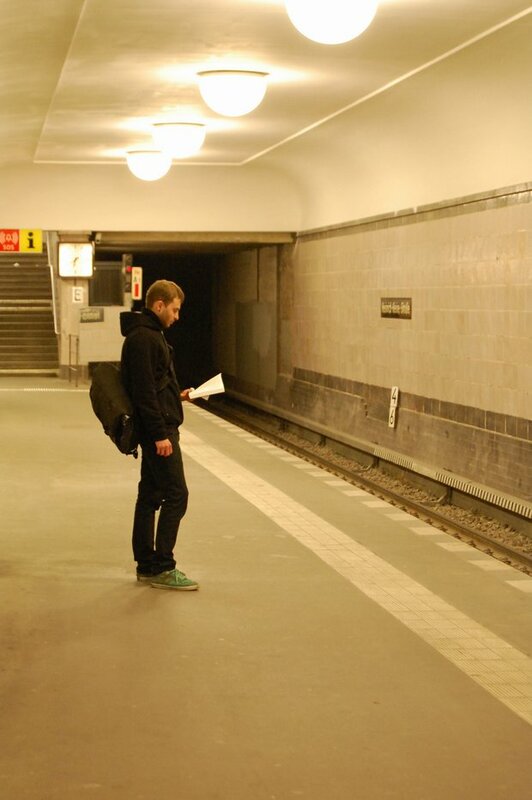 Get basic information like the title, author, UBahn destination and so on. Tip: Pay attention to time. Probably the trip is too short for a detailed discussion into the relation between psychoanalysis and deconstructionism. Step#4: Get off the ride and say goodbye to your friend. Now you are in platform. Look around and stalk on the next person who has a book in hand. Rule: This is a test of your connection (we call it yun fan in Chinese, you may see it as “fate”) to the book. Don’t think, just follow the immediate next you see. I need some warm up before interviewing. And she took just one station so that I didn’t have time to talk to her. I have to find next to start. What a day. The first book I met is „Aggression als Chance“ by Rüdiger Dahlke. It is read by a lady standing at the corner of a tumbling cabinet. 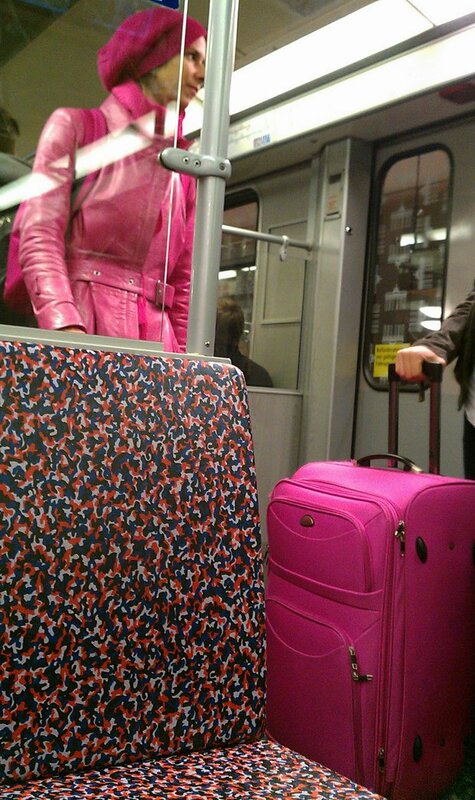 Before taking on board, what I first noticed was her large “tote (which can mean “dead” if perceived in German and with the title of her book) bag”. It looks heavy but she somehow managed to take them together with the book in hands. People say: “Like father, like son”. But this time I would have to say “Like book (title), different reader.” Not only can we not see any clues of aggression or violence in the lady, she actually gave me a very delightful impression by smiling all the way through my interview. 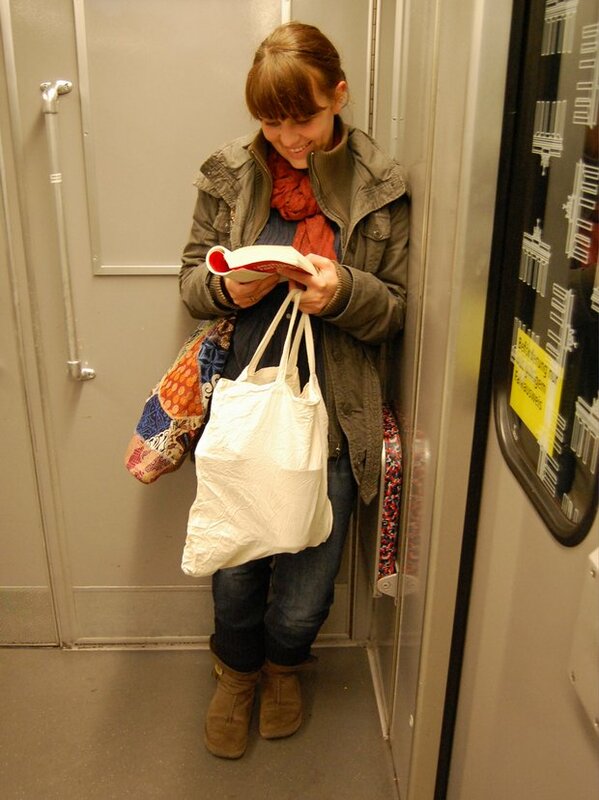 To her, reading in U-Bahn is as easy to focus as listening to a headphone. While the book is about psychotherapeutically justifying aggression as original energy for life, she said “It is like a spiritual thing.” How lightly does that sound! Now you know how different readers and their book can be. Medicine, sociology, politics and film. What shall one do after studying all those professions? Yes, of course: crime fiction writer. Perhaps it is this kind of craft that enchant a man to take nothing but a crime fiction for a ride. But that’s not all it takes. Jussi Adler-Olsen is a Danish author who gained an insight into extreme psycho illness from grewing up with his psychiatric father. He also opened second-hand book shop, turned comic books into collectables, edited and published Denmark’s first comic book encyclopedia “Komiklex”, and wrote two books on Groucho Marx. Isn’t he himself, like the title of his book, The Keeper of Lost Causes? The 2007 book is translated into German lately in title “Erbarmen” (Danish title: Kvinden i buret). Under his depiction, the protagonist is under a mysterious torture that she is trying to keep herself from going insane. One can easily imagine the author’s childhood experience in madhouse companying his father. 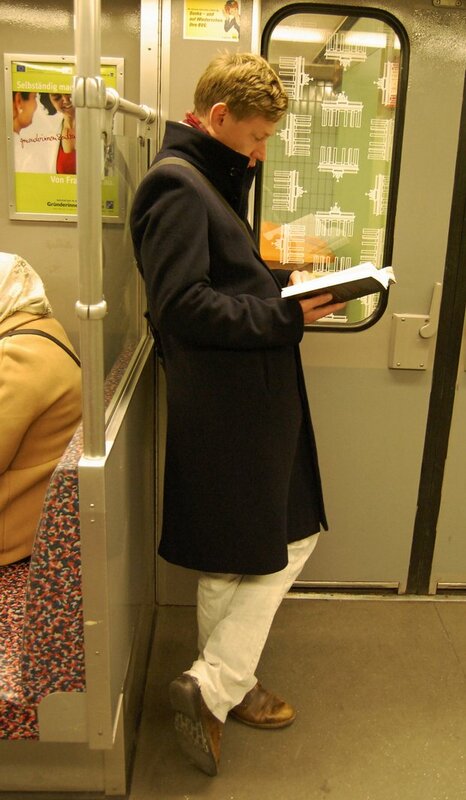 Now our reader in U-Bahn gets his book from his father as a present. What kind of influence can that be? Often the reader is as interesting as the author. 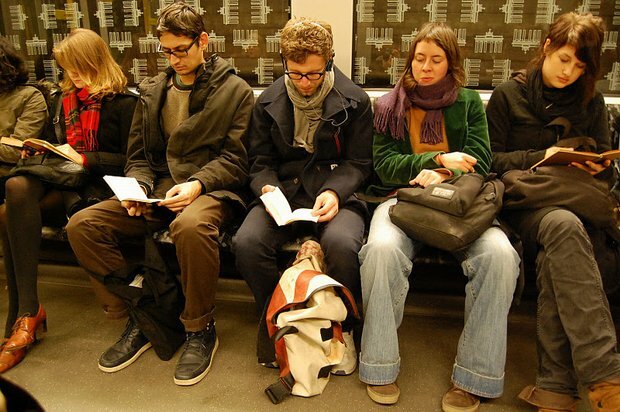 At first I followed Claire with her book “Et mon cœur transparent” by “Véronique Ovaldé, she took a seat in a bench full of people reading, then she decided to put away her book. Instead, she took out some kind of chewing gum or candy and did a little day dreaming. Claire is a professional psychologist and she also act in theatre as an interest. She especially likes the poetic tone of the novel and its subtle twist in gender relationship between husband and wife. I noticed that her bookmark is on page 32. She said that she picked up the book just yesterday but the book was a birthday present 1 year ago. I was thrilled by the impulse of picking up a book received one year ago for a ride, and she explained that it is probably because she wants to get refreshment from her work as a psychologist. I think possibly there is also some kind of metamorphosis going on in her. And I am pretty sure it is not a piece of furniture, probably something in a theatre? The station is ample and only a few people are waiting for a train. People can finally read in silence. Some people take the opportunity to indulge themselves into intellectual pondering. The environment is just as good as a library. Lately the #Occupy_ movement makes me wonder: where can’t people occupy and transform it into an intellectual and social symposium? Andrej is a student who was brought by his parent from Ukraine to Berlin some 20 years ago for the education system in Germany. He now studies (something like) Culture and Technology in HU, often finding topic to research on the relationship between humanities and technology. The book he was reading: „Von Lust und Freude” by Bettina Dessau, Bernulf Kanitscheider. According to him, it is about hedonism and it raises ethical and social question on how people orient their life according to pleasure and desire. I do think that in our narcissistic society, people tend to center life around their own desire. Therefore it is especially pleasing to talk to Andrej because he is a curious young man who also asked me back about my background. It then develops into a tiny talk about education… learning always attract people’s attention, and that may be how we can break the hedonism! Next: With all due respect, really. I found that many of my interviewees were reading quite the fore part of their book. Co-incidence? Or does it shows that books are really not meant to be finished all the time? I would like to find out. Also, I want to dig deeper into the content of the book. So far I have been doing too much internet research.